I’m not nervous, I’ve done this before, I’m definitely not nervous, I thought to myself as my eyes fixated on the altimeter strapped to the wrist of the instructor in front of me. 5,000 ft. Increasing numbers flashed across the oversized digital face at the alarming rate of a local taxi cab meter, like some kind of inverted final countdown. 6,000 ft. I’d been used to altitude with recent mountain treks but nothing like this. My mind was now flitting with disparate thoughts of outstanding work emails, wills, fitting freefall soundtracks and quotes from the nineties action film, Point Break. Just how had Patrick Swayze’s character Bodhi summed up the skydive experience? It escaped me as I was brought back to reality by a hearty slap on the shoulder from my instructor, Carl, who had been busy tightening straps behind me and securing my harness to his. 10,000 ft. Really, I’m not nervous. I started to feel my heart thumping through my chest and my body was clearly not buying this bravado. I looked for the altimeter but it was gone now, the man in front had already jumped. Another tap on the shoulder and it was time. We shuffled forward to the gap where the side of the plane should have been and perched on the edge, teetering over nothingness and I suddenly remembered Bodhi’s quote. “One hundred percent pure adrenaline”. For some reason I remembered it being more poetic than that but no more time to think. We were gone. My first skydiving experience was all a bit of a blur but was one of the highlights of a rather whistle-stop tour of the North Island of New Zealand in 2006 (others were, rolling down a hill in a plastic orb and eating possum pie – not concurrently). I was one of a busload of backpackers shipped off to a skydive centre on Lake Taupo, a testosterone-fuelled hub of high-fiving instructors and blood-pumping heavy metal music. There was much talk of ‘drop zone’ and ‘terminal velocity’ as well as the odd industry joke such as, “If at first you don’t succeed, skydiving really isn’t for you”. The airfield oversaw hundreds of tandem skydives per day and we were quickly churned out and back on the bus via a stunning decent from 13,000 ft over the lake and breathtaking Lord of the Rings countryside. Over so quickly, it was a truly amazing experience and, yet, when I have tried to describe it since, I’ve struggled. I liken it to when you go to see good stand-up comedy. Afterwards, you remember crying with laughter but can’t quite recall any of the jokes. So when the opportunity arose to repeat the experience seven years later over my hometown with Skydive Swansea, I jumped at the chance (forgive the pun). I arrived at Swansea Airport early on a brisk Saturday morning in February along with an excited but apprehensive group which included charity jumpers and those celebrating milestone birthdays. As we queued up to sign the paperwork, I glanced around the reception walls at the spectacular, colourful blow-up photographs of free fallers, looking equal parts bewildered and exhilarated against the blue sky. I’m not photogenic at the best of times and couldn’t imagine how I’d suppress a gurn while falling through the air at 120 miles per hour but these people seemed to manage it. The room had a relaxed feel, if relaxed is an appropriate word to describe the build-up to a skydive. There was still that Top Gun flight academy feel as instructors with nicknames such as Handsome Rob (I listened out for a Goose or Maverick), fleeted in and out of the room exchanging banter with each other and the students to put us at ease. Meanwhile, Sara at mission control, assigned us instructors, coordinated our flights and clearly and calmly ran through the day’s proceedings with us. We were then taken through our training and practiced as much as possible the landing and our freefall technique – arms tucked in with hands clasping harness, head back, knees bent, jump, one tap on the shoulder to open your arms, second to bring arms into chest as the parachute opens and then cue gravity. Carl and Ricky, my instructor and cameraman, made their friendly introductions and it was now time to get kitted out with a jump suit. My expectations were realistic. Naturally, I’d ruled out the Felix Baumgartner-style, daredevil space suit as a tad extravagant but perhaps something a little bit ninja? Not quite. It was decided to go in a different direction and that a bright yellow jump suit would be the most eye-catching for the camera (if not flattering). Less Top Gun, more top banana. Carl fitted my harness and supplied me with gloves, head guard and rainbow coloured neck warmer. Now all I had to do was wait patiently for my call. There are no allocated jump times. Circumstances such as weather and wind speed can quickly change and so patience is crucial as the team are vigilant that safety is paramount. Anyway, the anticipation only adds to the excitement or nerves depending on how you look at it. I put any pre-jump jitters into perspective by consoling myself that my instructor had carried out more than ten thousand jumps, that hundreds of thousands of people had done this and lastly that I was only leaping from 13,000 ft and not the 128,000 ft of Felix’s stratospheric jump. The call finally came and I made my way outside to the airstrip to the tune of Highway to the Danger Zone (playing only in my head). Any kind of swagger in my stride was undermined by the tightness of the harness so I made my way to the plane looking like a waddling Skittles advert. I clambered into the plane through the shutter door and took my place in line, seated in front of Carl on the floor of the plane. No seats, no in-flight movie, no drinks trolley for the aisle, no aisle, just two rows of jumpsuits, squashed into rowing boat formation. The engines roared, signalling the point of no return and we began the ascent. After fifteen minutes of flight, the shutter opened and the cabin quickly began to empty as the tandems followed the lone, experienced jumpers who fearlessly somersaulted out of the plane. As I slid over to the edge, Ricky was already clinging to the outside of the plane, Spider-Man like, camera poised. I flashed an awkward grin to the camera, clutched my harness and tilted my head back. Ricky disappeared and then so did we. Nothing quite prepares you for that sixty second, freefall sensation. It only feels like falling briefly. Your body prepares itself for an immediate impact, an end product, like high diving into a swimming pool. It doesn’t arrive. Then, suddenly, there is no perception of falling at all. Instead you are flying. The familiar tap on the shoulder came, allowing me to spread my arms as we glide through piercing blue sky. The noise was indescribable as the cold air rushed around my face, deafening my ears, and taking the air from my lungs. I looked up and Ricky and his camera were level with us. I couldn’t keep the smile off my face despite wind whistling around my cheeks, which I imagine made me look like a Wallace and Gromit animation. There was just time for a few thumbs up for the camera and a failed attempt at one of Swansea City’s Michu goal celebration before the parachute was deployed. The noise, the tumble dryer effect was over and the contrasting silence incredible. We floated quietly through an ethereal haze of cloud with a clear view of Swansea now spread out below us. If you have ever doubted the beauty of Swansea and the Gower, as I admit I have done on occasion during endless wet summers, seeing it from the sky is a reminder of just how special it is with so much green, shoreline and water. We swooped in to land as the red landing cross on the airfield grass quickly came into view. In my head the landing would have been a bit more ‘James Bond’; a pin-point touchdown as Union flag patterned parachute detaches and jumpsuit is unzipped to reveal tuxedo. Of course, this was ludicrous. Besides, my parachute was purple (the Union flag would have clashed with my yellow ensemble). As practiced, I lifted my legs as high as possible and landed on my backside in a less than dignified manner but safely and comfortably. As I made my way back to the bunker on foot, I jabbered uncontrollably with the other jumpers, each of us too overwhelmed to sum up the experience as anything more articulate than ‘amazing’. It’s liberating, intoxicating and no matter how non-poetic, it is, “one hundred percent pure adrenaline”. Like beauty, that freefall feeling is difficult to define. 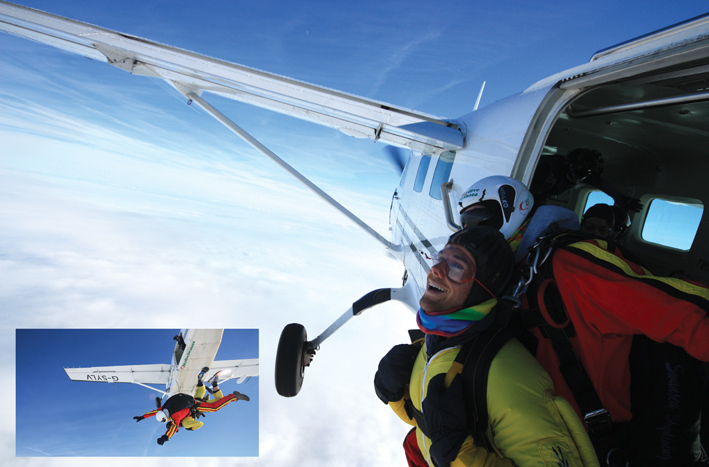 I’m certain there is no way other than to go through it yourself and if you do, Skydive Swansea can give you that experience of a life time…just make sure to ask for the blue jumpsuit.